British International Trade Secretary meets PM as Britain prepares to leave the EU and pursue an independent trade policy. 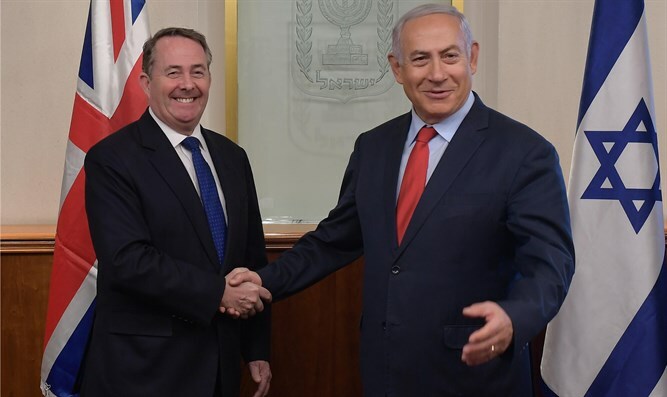 British International Trade Secretary Liam Fox met Israel's Prime Minister Netanyahu on Wednesday as his country prepares to leave the European Union and pursue an independent trade policy. Britain's exports to Israel already grew by 75 percent in the first half of 2018 compared to the same period last year, Fox's office said, citing Israeli official figures. Last year saw more than $9 billion in trade between the two nations, a record high, it said. "And as we leave the European Union and Britain takes up its place as an independent state of (the World Trade Organization), we want to push our concept of free trade even further," Fox told Netanyahu ahead of their meeting. "In a world where the siren calls of protectionism are rising, two free-trade nations like ours need to make the case for global free trade because trade spreads prosperity." Netanyahu said: "Britain is in fact our largest trade partner in Europe -- one of our most important trading partners in the world -- and we value the friendship." Israel is notably an import market for British cars, while Scotch whiskey sales in Israel have increased by 300 percent since 2012, according to Fox's office. Other leading British exports to Israel have included mineral products and machinery and electrical equipment, as well as chemical industry products, according to the British embassy. British Prime Minister Theresa May is seeking to convince hostile MPs to back her draft deal for future ties with the EU after her country exits the bloc next March. A vote is scheduled for December 11. Fox arrived in Israel on Monday and met with Palestinian Authority leader Rami Hamdallah in Ramallah on Tuesday.